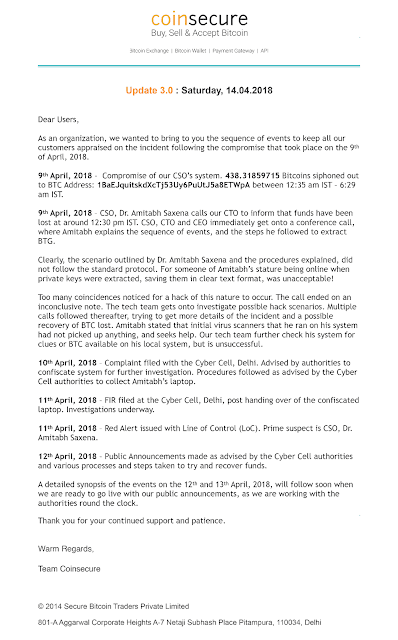 A few weeks back, we, at Bitcoin India Wiki, published an article titled Can Indian Bitcoin Exchange be Hacked. In the article, we highlighted our concerns regarding how almost all major cryptocurrency exchanges in India seems to be reluctant and vague at the security end. Aside from the standard assurance to their users, none of these companies made any proactive statements as to what safety measures they have taken to counter the rising threat of hacking and other cyber-attacks in the crypto-world. And the worse has now happened. 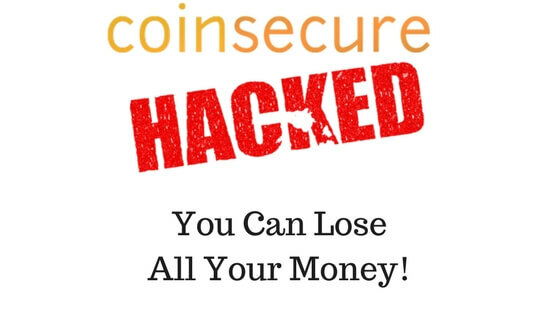 Coinsecure has lost Bitcoin worth of Rs 20 crore or $3.5 million in an alleged hacking. A total of 438.318 BTC has been lost in the attack. Although, the cryptocurrency exchange doubts that it is an insider’s job rather than an intrusion from a third-party. On April 12 (Thursday), Coinsecure issued a statement informing its users that its Bitcoin funds have been siphoned to an unknown account number- 1baejquitskdxctj53uy6puutj5a8etwpa. In the same statement, the company hinted that its CSO Dr. Amitabh Saxena may have a hand behind this. It claimed that the Bitcoins were lost when Dr. Amitabh Saxena was extracting the private keys of BTG from cold wallet to distribute them to the customers. It highlighted several discrepancies in this regular procedure that made Dr. Amitabh Saxena a prime suspect. 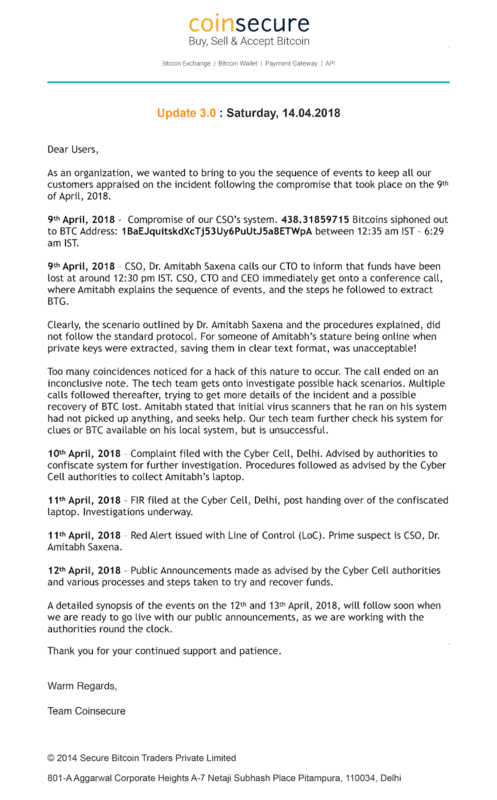 Coinsecure filed an FIR with cyber cell of Delhi. The investigation is underway. 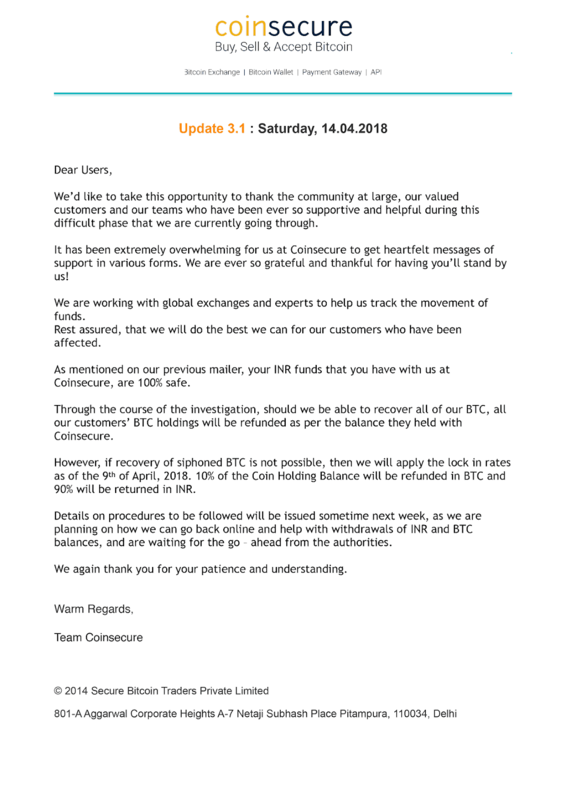 In the second statement on this matter that came a day later, the cryptocurrency exchange assured its customers that their funds are safe and in the coming weeks it will outline how users can withdraw their investment. The amount that customers will get will be calculated and returned as per the value of 1 BTC clocked on April 9. It also announced a bounty of 10 percent of 438.318 Bitcoin to anyone that helps the company find the “hacker” and recover the lost BTC. In the third statement, issued on April 14, Coinsecure further explained in detail what happened and how they lost Rs 20 crore worth of Bitcoin. They again suspected Dr. Amitabh Saxena, the CSO of the company, behind this “hack”. Per usual, they re-assured the customers and thanked everyone for the support. 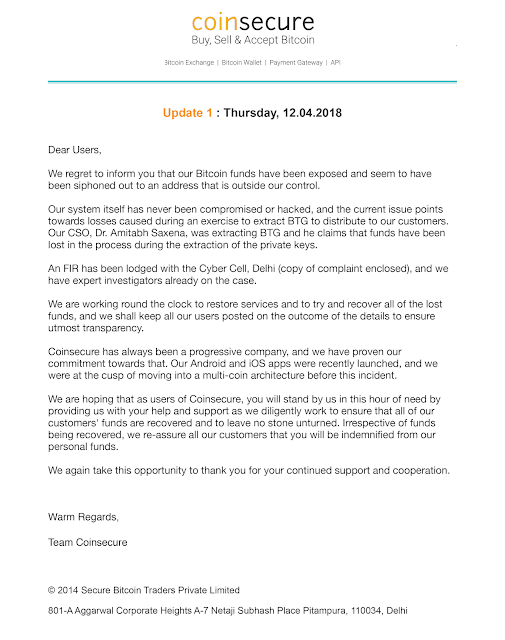 In its 4th statement inside on April 14, Coinsecure further added that the investigation is underway and they are working hard to track the movements of the fund. They also said that if they fail in retrieving the lost amount, they will pay the customers affected from their own pockets. 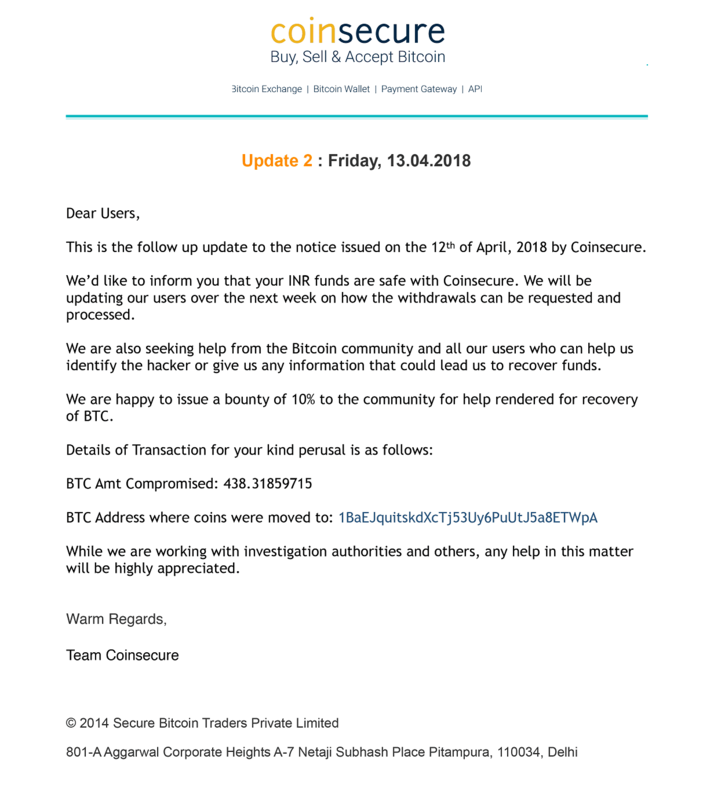 Whether the alleged hack of Bitcoins from the accounts of Coinsecure was a result of legit cyber-attack or an insider’s job, it’s yet to be officially confirmed. However, no one can deny that the risks and instances of cyber-attacks in the cryptocurrency world are increasing by the passing day. Many hackers are using advanced brute force to bypass the security measures of exchanges and hack the digital currency. The companies who have taken robust steps, they seem to be fine. But others, who still think that they won’t be hacked, they are the most vulnerable. But all being said, this is a clear indication for every other cryptocurrency exchanges in India to take security as the topmost priority. It is imperative that they take important steps to protect the funds of the users against all the external as well as internal factors. Along with countless industry experts, we recommend Bitcoin investors to use hardware wallet. If you own a large amount of BTC (or any other cryptocurrency) and you’re in this game for a long-term, you must protect your holdings in good hardware wallets like Trezor and Ledger Nano S.
Even if you’re a day trader, it’s always a good idea to store a large portion of your holding in the cold wallet. And with the remaining, you can trade all you want. Also, at the same time, you must take the necessary steps to protect your Bitcoin from hackers. Hopefully, what happened to Coinsecure doesn’t happen with other Indian Bitcoin exchanges. Others must learn from this and take the right measures accordingly. Subscribe to the topmost Bitcoin India Blog for more news, tips, and hot deals. How to Transfer Bitcoin from Zebpay to Koinex? How to Avoid Bitcoin Panic Sell (And Be A Smart Investor)? Should You Buy $100 Worth Hardware Wallet For Bitcoin? Bitcoin Price Prediction 2018: What Experts Are Saying? Where to Buy Bitcoin in India? Who Will Inherit Your Bitcoin After You Die?